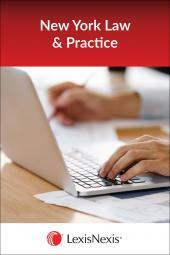 Use the definitive source for New York real property law as recognized by the courts, accepted by the market, and only available from LexisNexis. Warren's Weed: New York Real Property is recognized by the courts and market as the authoritative treatise on New York real property law. • and other areas of NY Real Property practice from A to Z.
Alfred C. Tartaglia, Esq., holds the position of Principal Law Clerk to Judge in the Supreme Court of the State of New York. As an employee of the New York State court system since 1983, he has been employed in the Appellate Division, First Department; the Appellate Term, First Department; and the Law Department of Sup. Ct. New York County. At the Appellate Division, he was editor-in-chief of all published memoranda, civil and criminal, and the author of the official court training manual for court attorneys, entitled "The Preparation of Civil Appeals" (1992). He continues to research complex legal issues, and draft decisions pertaining to both criminal and civil law issues. Mr. Tartaglia was the author of numerous chapters for various treatises before he was invited to become a General Editor for Matthew Bender and Company (now a division of LexisNexis) in 1999. 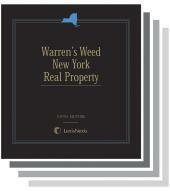 In that capacity he has updated two treatises on real property law and practice-Warren' s Weed New York Real Property and Steinman's Bergerman and Roth, New York Real Property Forms Annotated. From 1998 to 2002, Mr. Tartaglia was a lecturer at the New York County Lawyer's Association Writing Workshop, where he taught a three-hour writing course to law students designed to develop proficiency in legal writing. His curriculum and written materials continue to be used. As a Continuing Legal Education Lecturer at the New York State Court System Law Clerk Seminars (2000 to present), he prepared written materials and delivered lectures throughout New York State to attorneys employed by the Court System in the following areas of law: Jury Charges and Verdict Sheets, Settlement Skills and Techniques, and No Fault Law. Mr. Tartaglia is a graduate of Duke University, where he majored in English, and received his Juris Doctor from New York Law School in 1980. He was admitted New York State Bar in 1981, and the United States Supreme Court in 1999. He is a former Board Member and present chair of Continuing Legal Education Committee, Columbian Lawyers Association, First Department, 2001.